Many people think that a job equals economic security. But more and more of us recognize that this is often not the case. In fact, about one in five people in working families are economically insecure. Moreover, according to a recent report, less than one quarter of the U.S. workforce have “good jobs” in 2010—meaning they pay well and provide health and retirement benefits. Rural workers face particular roadblocks to finding and maintaining family-supporting jobs. Good jobs simply may be scarce in their community. Training and education opportunities may not be nearby or easy to access online. And they may have poor access to reliable transportation to get to work or to the child care, social and medical services they need to keep their family life on an even keel. Initiatives around the country are working hard to help move rural low-income workers into good jobs and out of poverty so they can Earn more and Keep more of what they earn. Rarely do we see an initiative where a set of rural businesses band together to take the lead in helping low-income workers get ahead. But we have that success story—right here in the RuFES Action Network. The economic health of a community relies on both the success of its employers and the financial success of its families. Working Bridges—an employer collaborative of 50 businesses in Chittenden County, Vermont—is improving employee retention, productivity and career advancement for their employees, while making things better for their families and communities. Read on for the story. RuFES at the 2012 Assets Learning Conference We are happy to annouce that that Lisa Falcone, from Working Bridges (the subject of this Alert), will be joining us as a presenter at our Community and Individual Assets Session at CFED’s Assets Learning Conference. If you have not already registered, please consider joining us for the conference and participating in RuFES-related sessions and a peer gathering. And don’t forget the RuFES Registration Discount! If you are interested in attending the ALC, please contact us so you can get a $200 discount off the conference price! In 2006-2007, the United Way of Chittenden County in Vermont organized a Bridges Out of Poverty: Strategies for Professionals and Communities training in their community to bring attention to the specific needs of local working families who were living in poverty. As a result, a small group of local employers started an employer collaborative, focused on how to address the needs of their employees in the workplace. This collaborative has grown into Working Bridges, a public-private, collaborative partnership focused on the retention, productivity, financial stability and workforce development of lower-wage workers. It is convened and managed by the United Way of Chittenden County. Over ninety percent (94%) of employer participants in this training report changes in their thinking and are motivated to make changes in their workplaces. Nearly twenty of these employers are now active members in an Employer Resource Network. Working Bridges’ Employer Resource Network is an employer-to – employer collaborative where employers share information about the challenges their low-and-moderate income employees face, especially related to transportation, health, workforce development and financial stability. Employers then develop and pilot new approaches to their workplace practices and policies to meet the workers’ identified needs. 71% of Employer Resource Network participants are changing practices and policies that affect their lower wage workers. An employer’s tuition reimbursement program limited to higher education was changed to allow employees to use this benefit to obtain a GED. An employer changed its matching retirement funds policy so employees are automatically enrolled in the program, rather than having to opt in—making it easier for more employees to benefit from the program. Employers, in partnership with local credit unions, offer Income Advance Loans to their employees (loans up to $1,000). Their employees then repay these loans through their paychecks over six months. Over 500 loans have been made to support employees’ needs and financial planning — 95% of which have been repaid on time and in full. These loan payments are not terminated unless requested, so nearly thirty-five percent of borrowing employees choose to continue savings after repaying their initial loan. 97% of recently surveyed employees report receiving timely assistance with barriers to work (financial, state benefits, housing, transportation, medical insurance, etc.). Over sixty percent (64%) of managers also report spending less time working through employee issues, and twenty-eight percent spend a lot less time. In partnership with employers, Working Bridges also offers programming for employees at their workplaces, including Volunteer Income Tax Assistance (VITA), financial counseling, GED classes and English language learning classes. Employers typically give employees a certain amount of paid time to participate in these programs. Helping workers become financially stable. In addition, three-quarters of participating core employers report improvement in one or more areas of employment trends (such as retention and attendance). Now Working Bridges is looking beyond employment retention to career advancement. Currently they are considering how best to provide better career paths and offer more workforce development for employees. To learn more about Working Bridges and see their current and past work, visit their website. You can also check out a Working Bridges’ employer’s story HERE. Contact Lisa Falcone, Working Bridge Project Director, with any specific questions by email. We hope these Action Alerts energize your RuFES deeds and aspirations. 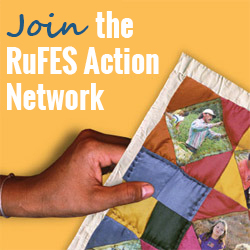 Help us spark more RuFES action! How? Simply contact us with any news, ideas or opportunities that can help your RuFES colleagues across the nation.